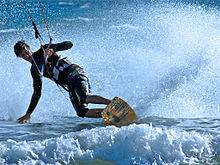 Kitesurfing combines the adrenalin and technics of surf, windsurf and wake boarding turning it into one of the most spetacular water sports known. Kitesurf, surf and windsurf look hard to learn but in reality are very easy. Most technics can be simulated on the beach and with a proper training program you’ll get the basics in just a few days. To initiate yourself on this magnificent sport you don’t need to be “extremely fit”. It is a very easy sport to learn. With our teaching programms you’ll learn in a fast and safe way. Sao Vicente holidays offers either private or group lessons (2 persons per instructor). All the equipment is included in the prices of the lesson. Our team members are mostly from the Cape Verde islands as we believe they can provide the best tuition as they have surfed here all there lives. Our constant presence at the school coupled with our focus on small groups and quality over quantity ensures that clients enjoy there stay with us. We teach in English and Portugese. We bring you to the beach of Salamansa, which is very beautiful and the conditions are there very good, the transport is from Mindelo from your hotel or room. 10h Full Course 449 €.